The Dilophosaurus lived 200-192 million years ago during the early Jurassic period. 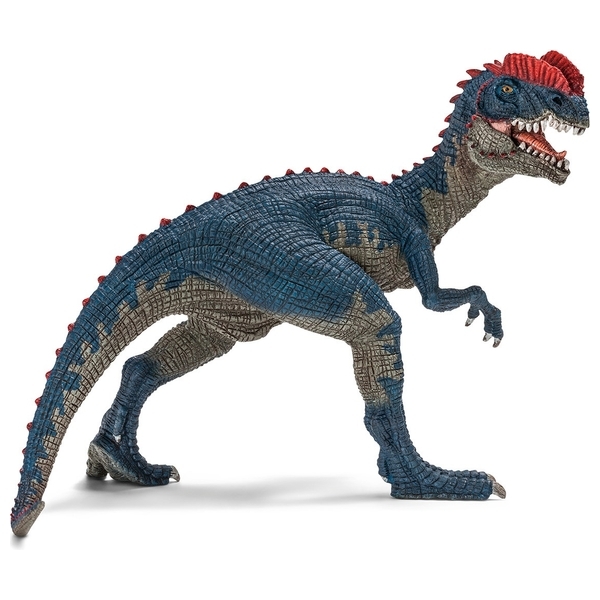 It was up to six metres long, and was one of the first large carnivorous dinosaurs of prehistoric times.After the Compsognathus and the Velociraptor, the Dilophosaurus was one of the fastest prehistoric saurians. Despite its six metre-long body, it weighed only 500 kg and had long, powerful hind legs, with which it could easily reach speeds of up to 38 km/h. It had two striking bone crests on its skull, which also led to it being called the "Double Crested Lizard". They were indeed big and long, but too thin to defend itself with. Scientists believe that they were used to impress rivals. A crocodile has the same typical notch in the upper jaw as the Dilophosaurus.